If you don’t shop at Ikea, you are seriously missing out. I know, I know, it’s a sad design world when every post-grad and their mother has the same particle board furniture. But the trick is NOT completely filling your home with doo-dads from just ONE store. And customizing the things that you do buy there….. When we were in Puerto Rico, our hotel…the La Concha…had a very swinging bar scene by the pool every night. To create that “swinging” atmosphere the hotel surrounded the pool area with these orange glass cube hurricanes. Simple orange glass boxes with candles. Very modern, very sexxxy. Of course I thought, “I can make those”. And I certainly could…..but maybe, I could make something similar (and slightly cheaper) with the Ikea lanterns we already have. 9 inches square, by 14 inches high…I’m sure you have seen them. Ours are galvanized, but they come in black and white too. Like everything at Ikea they are reasonable priced, at about 15 bucks each. There’s a smaller version, but I wouldn’t even bother with those. Make an impact. Buy the big ones. Trust Me. If you’ve never heard of theatrical gels, I’m sure you have seen what they can do. They are thin transparent sheets of colored polycarbonate, like a plastic water bottle, when inserted in front of a spotlight change its color. Gels are amazingly inexpensive and come in every color of the rainbow. (except black and clear, for obvious reasons) They are way much cheaper than colored glass…see where we are headed with this now, folks? 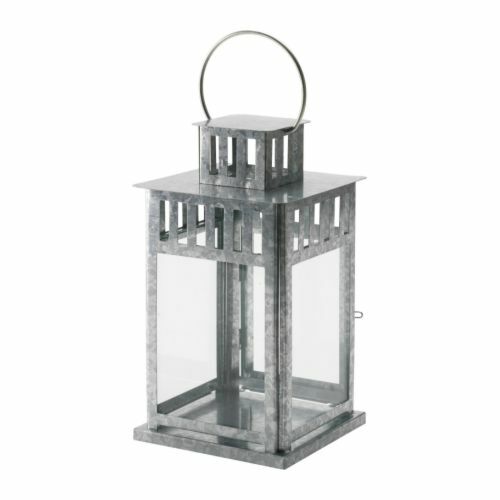 A 20″ X 24″ sheet is about 8 bucks….and a sheet and a half is enough for 2 of the big lanterns. I picked a few up at Norcostco Theater Supply here in Dallas this past week. Orange number 21, the darkest orange color they had. I started by cutting a few 10″ X 7″ pieces with scissors. Don’t worry if your edges aren’t perfect, no one will even see them. Adhering the gels to the glass is much easier than you might think. All it takes is Windex. 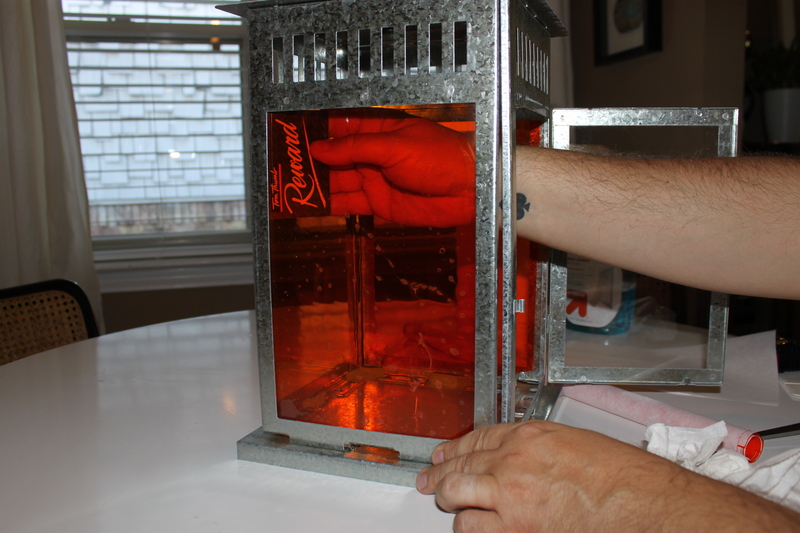 Clean your lantern glass really well, any specks of dirt will look like bubbles in your “colored” glass. Then spritz the entire glass surface lightly…. Remove the white tissue backing and lay your gel piece on the glass. This is why I do the inside of the lantern to hide all the rough edges of the gel. Otherwise you will have to trim every piece exactly to size. And who has time for that? 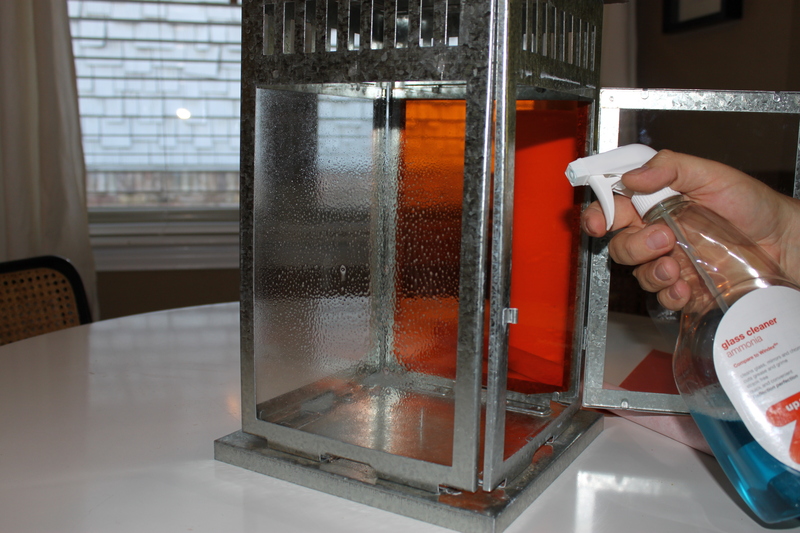 Now, use a credit card, or a Tom Thumb Reward card, to squeeze all the Windex out. Start from the middle and gently push towards the outside…. 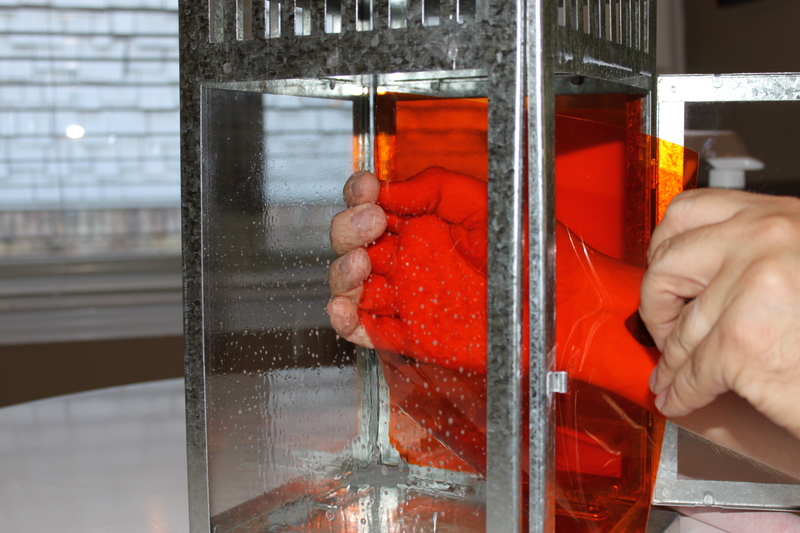 As the Windex dries, the gel sticks to the glass……it’s sssssooo simple. And they peel off when you are tired of them. You will want to make sure that your candle flame will be far away from the gel, or they melt….again, use the Big lantern. Look at all this Awesomeness……. 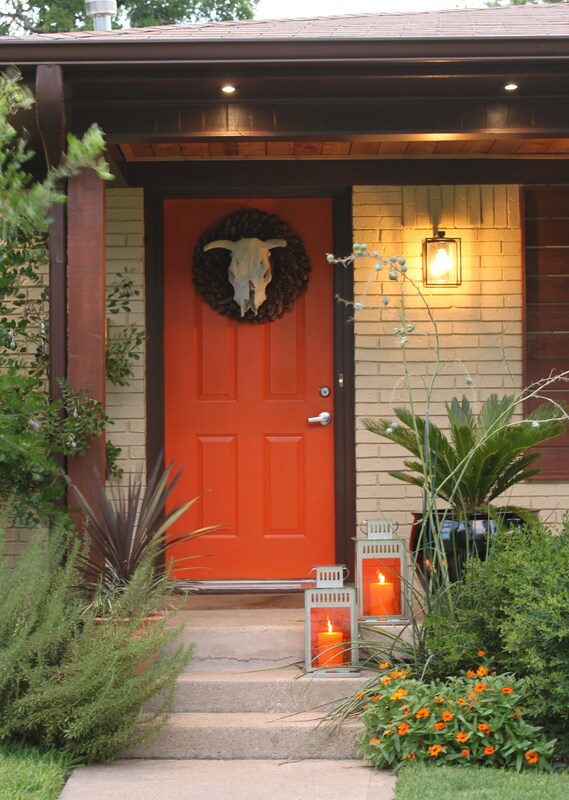 They look just GREAT with our currently orange front door too…. Choose any color you like. Just stick with the darker colors because they will make the most impact. 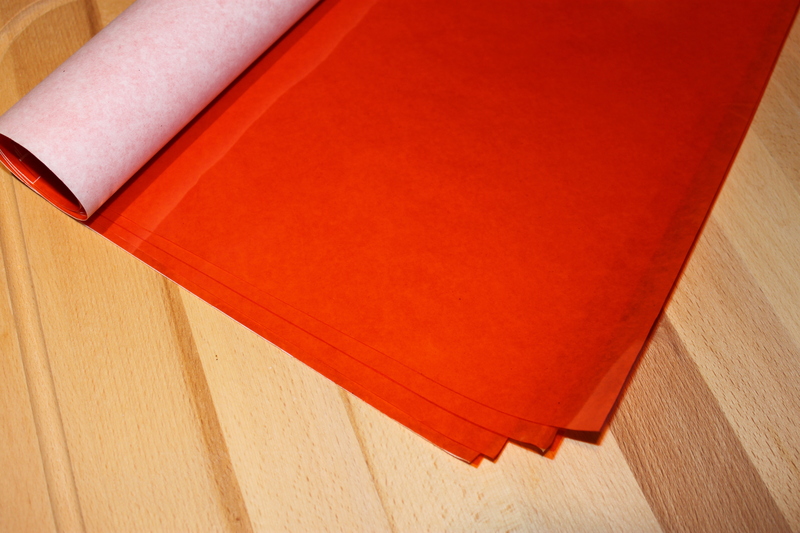 We happen to love orange in this house…but, I’m thinking red might be the way to go for Christmas this year…. OK….totally loving the lantern make-over! 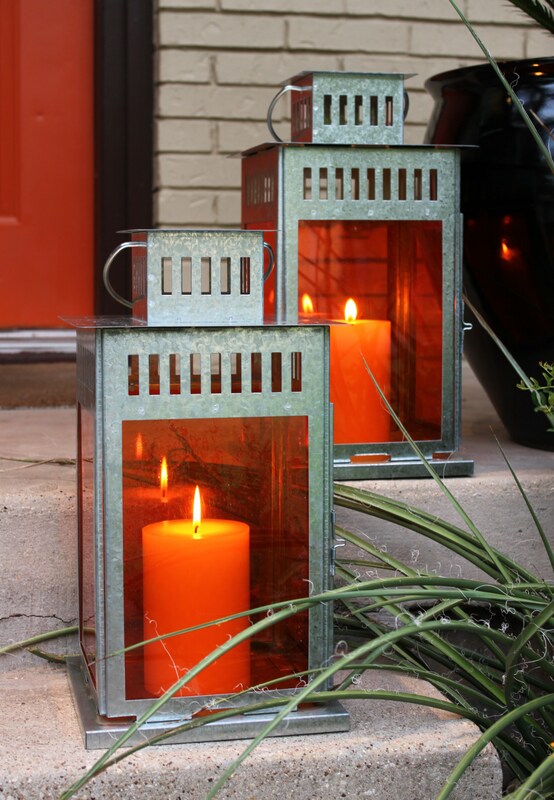 They work perfectly with your super-cool orange front door…and they really accent the orange flowers near the steps! Diggin’ it! Thanks Tina, They were soooooo easy. and I love them so much that I just couldn’t wait to publish this post! WOW! I love this idea!!! I would not have known where to purchase the gel so thanks for THAT tip as well! Vickie, you can use the gels to make “stained glass” french doors as well. or even wrapped around vases to make colored hurricanes inside….They are so cheap! We are all for…Simple, Cheap, and Easy..these were all 3…We’re so glad that you’re following along with us! James once again you post another great idea!! Beautiful! May I ask where you might be able to buy these online? I don’t have a theatrical supplies shop near me that I know of. The lanterns look absolutely lovely. Now, or I’d search for one for you. They are used for theatrical lighting. 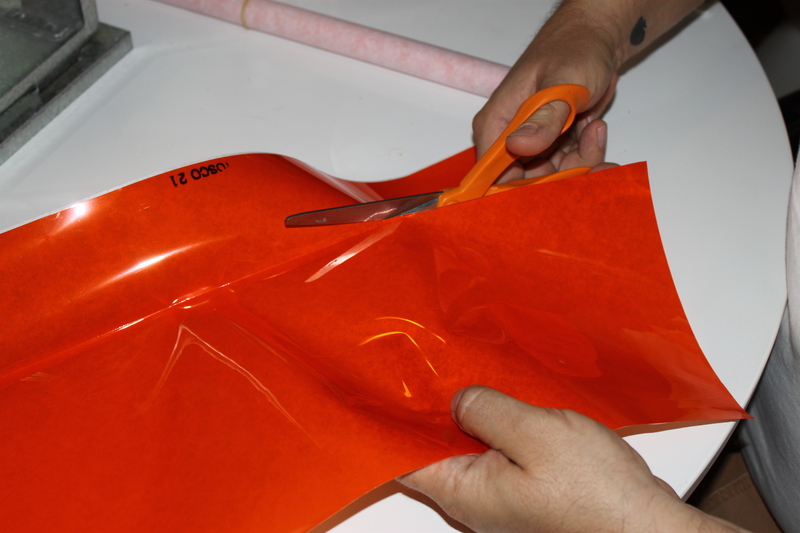 I’m sure you can use colored cellophane from a craft store…… But it’s usually not as thick or dark colored. Thank you! I’ll take a look. Have a safe trip! Very cool!! And so many possibilities for so many holidays and events! Thanks for sharing! This rainy Dallas day has ruined our plans for roofing our tool shed, so Jamie is replanting the barrel (6th time, I think) and I’m cleaning inside. I promise that we both scaled down our possessions before moving into the Cavender house……but continue to surround ourselves with “memorabilia”…We are thrilled that you found us, makes us a little nervous when people read too far back (the first few posts were a little “weak”)…..